What has a man whose obedience once caused a barren stick to blossom forth a tree in the desert to tell us today about the life of virtue? Is it possible for man today to partake of all the virtues? 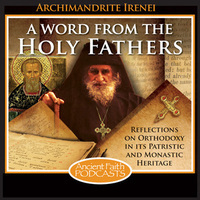 In this week’s broadcast, Archimandrite Irenei examines two sayings of Fr. John the Short of Egypt on the accessibility of all the virtues through the foundation of the love of neighbor.